. Serving Size: 3 softgels.
. 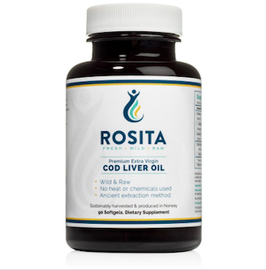 Ingredients: Wild & Raw Extra-Virgin Cod Liver Oil, antioxidants (trace amounts of rosemary extract and non-GMO full-spectrum natural vitamin E), softgel (fish gelatin, water, glycerin).
. Provides 143 mg EPA and 195 mg DHA per serving.
. Provides 145 IU vitamin D3 and 1,450 IU vitamin A per serving.